backgroundColorObj = BackgroundColor() creates a white background. backgroundColorObj = BackgroundColor(color) creates a background color object based on the specified CSS color name or hexadecimal RGB color value. The name of a color, specified as a character vector. The name must be a CSS color name. See https://www.crockford.com/wrrrld/color.html. Hexadecimal RGB (red, green, blue) color value, specified as a character vector. Use the format #RRGGBB. Use # as the first character and two-digit hexadecimal numbers each for the red, green, and blue values. For example, '#0000ff' specifies blue. 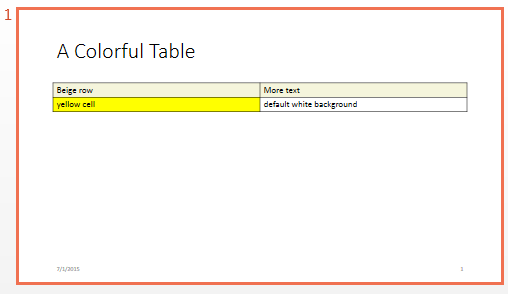 Background color for a report object, returned as an mlreportgen.ppt.BackgroundColor object. An RGB value, using a character vector having the format #RRGGBB. Use # as the first character and two-digit hexadecimal numbers each for the red, green, and blue values. For example, '#0000ff' specifies blue. Create a table with different color rows and table entries. Set up a presentation with a slide titled A Colorful Table. Define the table, specifying different colors for the top row and for the first entry in the second row.